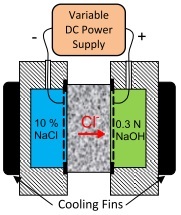 By measuring the penetration depth of chloride ions, after an electric potential has been applied to the specimen in accordance with Nordtest Build 492 to determine the “Chloride Migration Coefficient,” which can be used to estimate the chloride diffusion coefficient for service life calculations. By measuring the current passing through a saturated concrete specimen and determining the bulk conductivity in accordance with ASTM C1760. 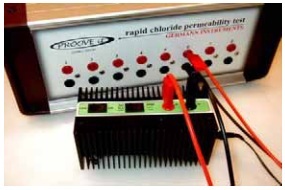 ASTM C1202 “Standard Test Method for Electrical Indication of Concrete’s Ability to Resist Chloride Ion Penetration” is actually a test of electrical conductance, rather chloride permeability as is often stated. As discussed on page 88, electrical conductivity is related to the diffusion coefficient. 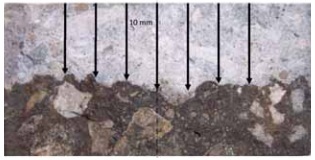 In this test, a water- saturated concrete specimen, nominally 100 mm diameter and 50 mm thick, is positioned in a test cell (right and pg. 121) containing fluid reservoirs on both ends of the specimen. One reservoir is filled with a 3 % NaCl solution and the other with a 0.3N NaOH solution. An electrical potential of 60 VDC is applied across the cell. 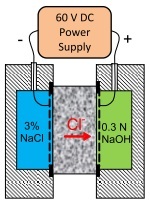 The negative terminal of the potential source is connected to the electrode in the the NaCl solution and the positive terminal is connected to the electrode in the NaOH solution. The negatively charged ions will migrate towards the positive terminal resulting in current through the specimen. The current is measured. To use PROOVE´it for the chloride migration test described in NT Build 492 “Chloride Migration Coefficient from Non-Steady State Migration Experiments”, the reservoir surrounding the negative terminal is filled with a 10 % NaCl solution and the reservoir surrounding the positive terminal is filled with a 0.3N NaOH solution. A 30 VDC potential is applied across the specimen, and the initial current is measured. Based on the measured initial current, the test voltage and test duration are selected accordingly. 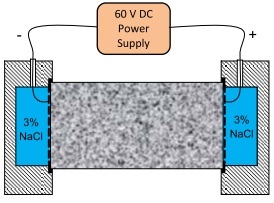 For example, if the initial current is between 120 and 180 mA, the test voltage is 15 VDC and the test duration is 24 h, but if the initial current is less than 5 mA, the test voltage is 60 VDC and test duration is 96 h. After the test is completed, the specimen is split, and the chloride ion penetration is measured by spraying the split surface with a 0.1 M silver nitrate solution, which precipitates as white AgCl where chlorides are present. 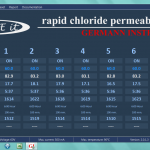 From the penetration depth and test conditions, the chloride ion migration coefficient is calculated. It is important to maintain a constant temperature in the solutions in the reservoirs. 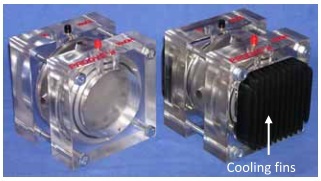 Therefore, cells with cooling fins (Part No. PR-1100) are recommended. 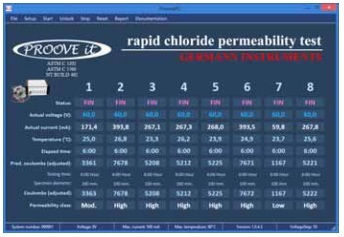 There is also an AASHTO test method TP-64, “Standard Method of Test for Predicting Chloride Penetration of Hydraulic Cement Concrete by the Rapid Migration Procedure,” that uses the same procedure as NT Build 492. The test result, however, is reported as a rate of penetration, by dividing the depth of penetration, in mm, by the product of applied voltage (V) and the test duration (h). ASTM C1760, “Standard Test Method for Bulk Electrical Conductivity of Hardened Concrete,” involves the same basic testing procedure as ASTM C1202, with the following exceptions: 1) both reservoirs contain the 3 % NaCl solution; 2) the specimen length can be up to 200 mm; and 3) the current is measured at 1 minute after turning on the power supply. 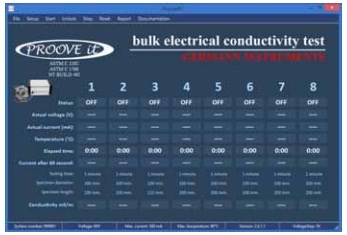 The bulk electrical conductivity is calculated using Eq. (2) on page 89. As was discussed on page 90, different ranges of bulk electrical conductivity correspond to different ranges of charge passed in accordance with ASTM C1202. At 60 VDC, the accuracy of the PROOVE´it microprocessor power supply is within ± 0.1 mA for a current between 30 mA and 300 mA. The repeatability of the RCPT or Coulomb Test is reported to be about 12 % (ASTM C1202), and the repeatability of the migration test is reported to be about 9 % (NT Build 492). 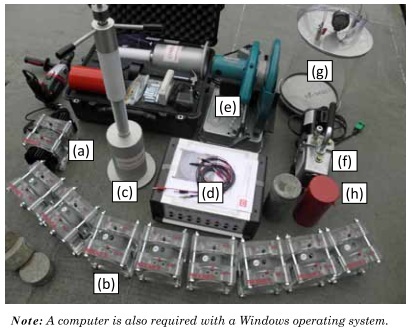 A complete system composed of coring and slicing equipment, vacuum desiccator, vacuum pump, watertight test cells, microprocessor power supply, and software are presented below. The cells are easy to assemble, simple to maintain, and watertight. 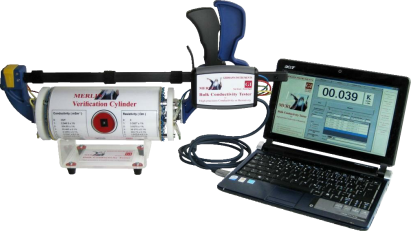 RCPT : The image to the right shows the screen display when PROOVE´it is used for the RCPT test (ASTM C1202). Pointing with the mouse cursor on any of menu items will produce a pop -out window with explanatory notes for that item. The window shows the details of the test. The “Status” line for the eight cells indicates OFF, ON, or FIN, depending on whether power to the cell is turned off, if the cell is operating, or if the test has finished. The “Actual voltage” line indicates the test voltage, which has to be the same for all cells. The “Actual current” line indicates the instantaneous current during testing. Readings are updated every 5 seconds. The “Temperature” line indicates the instantaneous temperature in the reservoir solutions during testing if temperature sensors are used. “Elapsed time” indicates the cumulative time since the cell was turned on. The “Pred. coulombs (adjusted)” line indicates the predicted Coulombs at 6 hours, which are estimated continuously every 5 minutes while the test is running. “Testing time” indicates the selected testing time, and the “Specimen diameter” indicates the actual diameter of the specimen. The “Coulombs (adjusted)” line indicates the measured Coulombs at any time during testing, which have been adjusted for a specimen diameter of 95 mm as required by ASTM C1202; so when the test ends, it indicates the test result. The last line shows the “Permeability class” according to ASTM C1202. Migration: For using PROOVE´it to determine the chloride migration coefficient in accordance with NT Build 492, a two-step process is used. First the cells are set up for a voltage of 30 V, the cells are turned on and the initial current is recorded. The cells are turned off. Based on the initial current, the operator selects the test voltage and test duration in accordance with recommendations in NT Build 492. Test voltage may be from 10 to 60 V, and test duration may be from 6 to 96 h. A higher voltage and longer test duration are required for higher quality concrete mixtures. Cell temperature must be measured during the test. At the conclusion of the test, the specimen is split in half, the surface is sprayed with a 0.1 M silver nitrate solution, and the average depth of chloride penetration is determined by making seven measurements in the central 60 mm of the specimen as shown above. The average chloride penetration, the applied voltage, average temperature of the sodium hydroxide solution, test duration, and specimen thickness are used to calculate the non-steady-state migration coefficient. Conductivity: The image to the right shows the screen display when PROOVE´it is used to measure bulk electrical conductivity in accordance with ASTM C1760. A separate program is used for this test. The user sets up the test by entering the length and diameter of the specimens for each cell. The voltage is set to 60 V and the cells are turned on. The test runs for 1 minute, at which time the currents recorded during the last three readings are saved, averaged, and used to calculate the bulk conductivity, which is displayed in units of mS/m. For concrete with adjusted Coulomb values in the range of 500 to 4000 C, the bulk conductivity is expected to be in the range of 3 to 20 mS/m. The software includes the PROOVE´it Report Manger for preparing professional quality test reports, which can be customized with the purchaser’s company logo. Data recorded during each test are stored in a database allowing a complete review of data if anomalous results are encountered. Customized labels can be attached to each test for complete project documentation. Test results can be exported to Excel for comprehensive statistical analyses of the results and preparing user defined control charts. As was discussed on page 88, there is a theoretical relationship between the chloride diffusion coefficient and electrical conductivity. The chloride diffusion coefficient can be determined directly by profile grinding (pg. 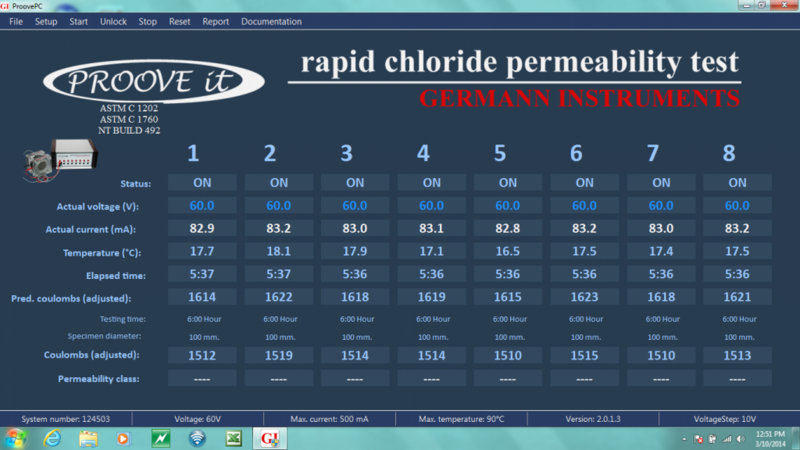 113) and testing for chloride ion content (pg. 129) after ponding with a NaCl solution, in accordance with NT Build 443 “Concrete, Hardened: Accelerated Chloride Penetration” or ASTM C1556 “Test Method for Determining the Apparent Chloride Diffusion Coefficient of Cementitious Mixtures by Bulk Diffusion.” The required ponding period is at least 35 days. A correlation can be developed between the diffusion coefficient and any of the other properties determined with the PROOVE´it. The following shows examples of correlations that have been found. In a study by Obla, Kim, and Lobo (2014), the apparent chloride diffusion coefficient was determined in accordance with ASTM C1556. Specimens from 5 concrete mixtures were subjected to 59 days of standard curing and then subjected to 16 months of immersion in the NaCl solution. Companion specimens were tested in accordance with ASTM C1202 and AASHTO TP 64, after standard curing at 23 °C for 56 day or for standard curing for 7 days followed by curing at 38 °C for 21 days. For the ASTM C1202 tests, the current at 5 minutes was measured and used to calculate the electrical conductivity. The following plots show the correlations between various test results. Also shown is the relationship between the charge passed and the 5-minute electrical conductivity measured by the ASTM C1202 test. The last plot (lower right) also shows the theoretical relationship. 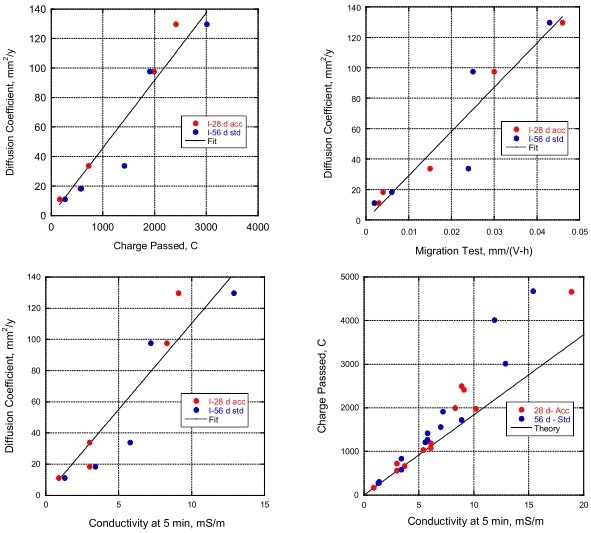 The above plots show that there are strong relationships between the various electrically based test methods and the apparent chloride diffusion coefficient. Obla, K.H., Kim, H, and Lobo, C.L., 2014, “Selection of Rapid Index Tests and Criteria for Concrete Resistant to Chloride Penetration,” paper presented at Transportation Research Board Meeting, Washington D.C., Jan. 2014. 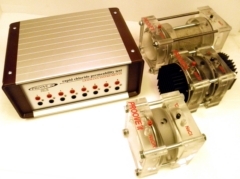 Two types of cells are available, the PR-1000 cell and the PR-1100 cell, shown below. The PR-1000 cell is the standard cell. The PR-1100 is supplied with cooling fins, which are needed if the temperature is required to be kept constant, as for example, for chloride ion migration testing using the NT Build 492 test method. The cell is sealed by tightening the four corner bolts, which squeezes the gaskets against the specimen. The cells are supplied with PR-1010B gaskets, unless otherwise specified. The PR -1010B gaskets match the 100-mm core diameter produced by the CEL-100 coring equipment. 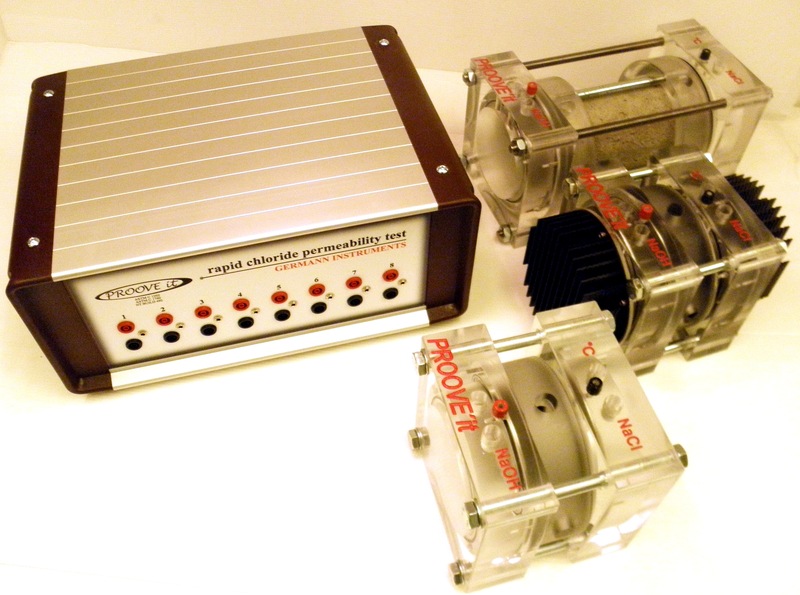 The PROOVE’it cell can be attached to a set of 4 extension bolts in order to test longer specimens and measure bulk electrical conductivity, in accordance with ASTM C1760. The PR-1055 verification unit is used to verify that the microprocessor controlled power supply is working properly. The unit is connected to line power, 110 VAC or 220 VAC. 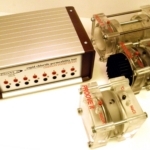 Each channel of the PROOVE’it power supply is set up for testing at a selected voltage and connected to the verification unit. If the PROOVE’it system is operating properly, the “Actual current” indicated on the computer screen (see page 118) should be within 30 mA ± 0.1 mA or 300 mA ±0.1 mA for the two switch settings on the verification unit. *These items can be selected as needed to assemble a system to meet the purchaser’s requirements.